Tassels are a fun addition to an array of knit and crochet projects. They are especially nice on scarves, belts, home decor items and anything else you think might need a little extra embellishment. Tassels can be helpful for eliminating the curl of stockinette stitch at the bottom of a project. 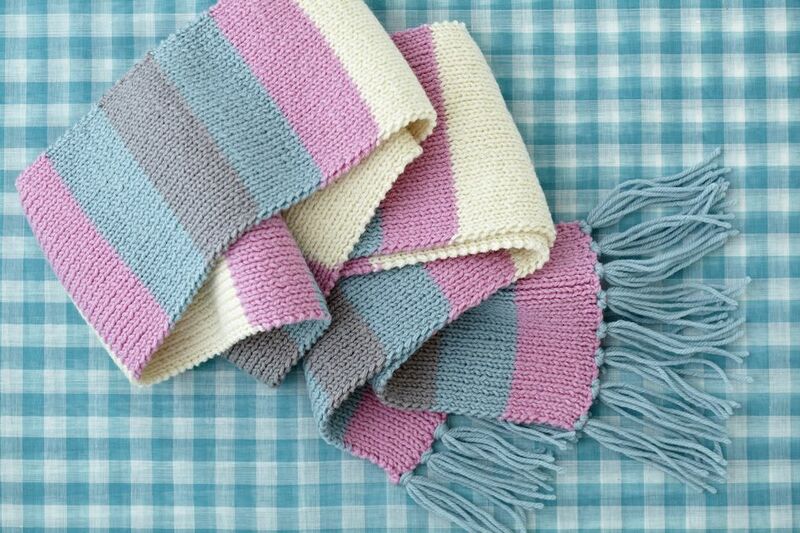 They also can make a simple project a little more interesting, transforming that easy scarf which took no time into something a bit more gift-worthy. Better yet, tassels are easy to make! Tassels can be any length you like, but you'll usually find them between 6 inches and 1 foot in length. You need to begin with strands of yarn that are double the finished tassel because they will be doubled when forming the tassel. Cut the yarn 1 or 2 feet long to be safe. You can always trim more off later but will have to start from scratch if the tassels are too short. Tassels can also be made of as many or as few strands of yarn as you like. Three strands is a nice minimal number for general use because it will create six strands hanging from each tassel. You'll also want to gauge this based on your yarn. Bulky yarns will create full tassels with just one or two strands. Additionally, you can have as many tassels as will fit along the edge of your knitting or just a few. Individual preferences on these matters vary, but most people find odd numbered items look better. You might stick to an odd number of tassels—three, five, or seven are good for most projects. Plan out your spacing ahead of time. You can mark it temporarily with stitch markers or safety pins to get a visual reference if needed. Once you have figured out the length of yarn needed, how many strands you want for each tassel, and how many tassels you need, it's time to start cutting your yarn. If you intend to use all the yarn you have on a project, make sure you have enough for tassels by cutting the lengths needed before you start knitting. Use a ruler, tape measure, piece of cardboard or another measuring device to cut all your tassel pieces to a uniform length. Divide the strands into piles, one pile for each tassel that you need. Straighten each stack so the threads line up. Fold the stack in half. Use a crochet hook to pierce your knitting where you want the tassel to go. Make sure you're going between stitches and not through the yarn itself. Hook the loop you just made by folding the tassel yarn in half onto the crochet hook and slide it through the knitted article. Take the loop off the hook and slip the tassel ends through the loop, going over the edge of the knitting. Pull tight to make the tassel. Repeat as many times as needed to complete your project. Place your tassels in the first row of knitting next to the cast-on or bound-off edge rather than right on the edge of the knitting. This should make it a little easier to see what you are doing and it hangs nicely. Space tassels evenly by placing your first one in the middle of the work, then one on each end. If you have more than three tassels, space the rest evenly in the remaining space. It doesn't matter if you form the tassels from the right side or the wrong side of your work. Just make sure you do them all consistently so they look the same. What is Mercerized Cotton Yarn and How Is It Used in Knitting Projects?